The first enemy attack on Australian soil in the history of the Commonwealth of Australia occurred at 0958 on Thursday 19 February 1942. 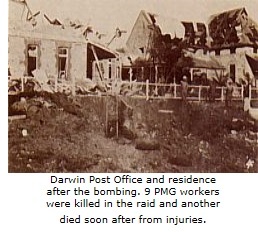 The small Northern Territory town of Darwin suffered an air-raid attack by 188 Japanese aircraft. At the time of the attack the civilian population numbered less than 2000. The man who had led the attack on Pearl Harbour, Mitsuo Fuchida, was in command of this first attack on Darwin. It had been launched from four carriers, Akagi, Soryu, Hiryu and Kaga, about 500km to the northwest. Since the rapid advance of the Japanese war-machine after Pearl Harbour, some efforts had been made to secure the defence of the Darwin area. Darwin was the base of the 7th Military District of Australia. Larrakeyah Barracks contained men of the 23rd Australian Infantry Brigade. 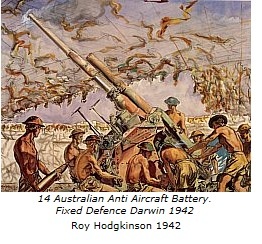 There were also two Australian Infantry anti-aircraft batteries. The important RAN base at Darwin included a floating dock. The RAAF was represented at a base, built in 1940, 8km south of Darwin. Ironically, a radar station at Dripstone Caves outside Darwin was not yet operational. This newly invented aid, however, was eventually of great help in forestalling subsequent air attacks on Darwin. There had been small numbers of American service personnel in northern Australia since before the attack on Pearl Harbour but from January 1942 a US presence began to extend to many other Australian cities. Civil defence left much to be desired. By late December most white and Asian women and children had been evacuated from the town. Little though seems to have been given to the large Aboriginal population. They were expected to fend for themselves. Those white women who stayed, about 63, were for the most part employed in essential services, such as nursing and telegraphy. Some civilians and organisations had dug slit trenches and there had been several trial air-raid alarms, but overall defences were inadequate. A tragedy of errors ensued. By late February Port Darwin had become an important staging point for ship convoys and aircraft on their way to the fighting to the north-west. The port was particularly crowded on the 19th. A convoy of ships carrying Australian and American troops and supplies, escorted by USS Houston, had returned to port after an attack by Japanese aircraft and submarines. (Their objective had been embattled Timor). The congestion of the port contributed to the large number of casualties that followed. Coastwatchers, often civilian and largely unknown and unsung, proved to be a vital part of the Australian war effort. Forty-three minutes before the bombing, John Gribble, a coastwatcher on Melville Island, radioed the naval station that a large number of aircraft was flying toward Darwin. A few minutes later, Father John McGrath, of the Catholic mission station on Bathurst Island, radioed Lou Curnock of the Darwin Australian Amalgamated Wireless station reporting a similar message. Curnock immediately transmitted this to the RAAF. These warnings were not acted upon, thus increasing the number of casualties as ships and planes were not moved. The RAAF Operations Centre was not alarmed. Despite the different direction from which the planes were travelling the RAAF officers believed that the aircraft were American P40 Kittyhawks which had been forced by bad weather to return from a sortie to Timor. In fact, nine of the ten US Kittyhawks were approaching the airfield as the Japanese Zeros flew in and the Kittyhawks were shot down immediately. Four US pilots were killed in the attack. The airbase was therefore unable to mount any counterattack. It was left to the anti-aircraft batteries to try to defend the town. Although they kept up a continuous barrage from their gun emplacements, only one Japanese aeroplane was shot down by their fire. The main target for the first attack was Darwin's harbour. There were upwards of 45 ships in the port, including the US destroyer Peary. Within minutes Peary had been sunk with a loss of 80 lives. Sunk also was the large US transport Meigs, though with a loss of only two lives. The Australian ship Neptuna, formerly a passenger vessel, was hit. Loaded with heavy explosives, it blew up with a terrifying explosion. The ship's captain, William Michie, and 45 crew members were killed. Five merchant ships were sunk. The hospital ship Manunda was hit but survived to play an important role in caring for the injured; 58 crew and medical staff were wounded on that day and twelve were killed including 26 year old Sister Margaret deMestre. One of the most dramatic events of the affray involved HMAS Katoomba, a corvette being repaired in the floating dry dock. Although the ship was trapped in the dock its captain, Commander A.P. Cousin, RANR, ordered the 12-pounder high-angle gun and Vickers machine guns, together with rifle fire, to open up on the enemy divebombers. Both ship and dock survived, largely undamaged. Just before the air-raid alarm and the arrival of the Janapese planes, 70 waterside workers had been unloading the Neptuna and Barossa on the right-angled extension of the long pier. When the pier was hit many wharf labourers were marooned on the edge. Dozens of men were blown into the water only to have to swim through burning oil. Twenty-two are known to have died. There were many heroic acts as the dead and dying and survivors were plucked from the water by men in small boats. In the town the Post Office had been hit and nine peopled killed. These were the Postmaster, Hurtle Bald, his wife Alice, and daughter Iris, four women who had remained in their essential jobs as telephonists, Emily Young, Eileen and Jean Mullen, Freda Stasinowsky, their supervisor, Archibald Halls, and another PMG worker Arthur Wellington. The air-raid trench in which they had sought shelter in the Post Office garden had received a direct hit. Walter Rowling, a telephone technician, later died from injuries sustained in the raid. Darwin Hospital was also bombed, fortunately with no loss of life. At Government House the Administrator of the Northern Territory, Charles Abbott, his wife Hilda, and members of his staff sheltered from the bombing under the house. Daisy Martin, an Aborigine, and one of the Administrator's servants, died when a concrete block fell on her. All the others survived. There were some extraordinary stories of escape from injury, such as that related by Douglas Lockwood in his graphic book on the bombing, Australia's Pearl Harbour. Reginald Rattley, aged 26, a telephone mechanic, had tried to shelter with the Postmaster's group but found the trench too crowded. He sought shelter over the Esplanade cliff to the beach. As he jumped a bomb-blast lifted him bodily on to the sand where he landed safely. By 1030 the first raid was over. It had lasted just over half an hour. The shocked surviving population was just emerging from cover and trying to assess the damage when at 1158, the attack resumed. The second raid was launched from land in the Celebs and Ambon, recently occupied by the Japanese. This time the airfield was the target, the Zeros strafing and saturation bombing the airstrip with its easily targeted, un-camouflaged aircraft. The remaining Kittyhawk was destroyed together with a Liberator, three Beechcraft, three US Navy Catalinas, six RAAF Hudsons and a Tiger Moth. Surprisingly, only seven men were killed, including Wing-Commander Archihbald Tindal RAAF. Air Force and military personnel did not, on the whole, feature well in many of the events immediately following the end of the bombing. Hundreds of Darwin civilians acted the way many people do under war conditions : they became refugees, leaving the town by any means they could. But many RAAF personnel also fled. Nearly 50 years later, the events of 19 February 1942 at the RAAF base are still not fully explained. It seems that immediately after the bombing the commander, Wing-Commander Stuart Griffiths, gave an order for the men to “go half a mile down the road to Adelaide Waters and half a mile into the bush". Among many of the largely undisciplined and thoroughly scared airmen, this order was taken as 'go bush'. Many did. One is reported to have kept going until he arrived in Melbourne thirteen days later. By the weekend order had been restored, but not until after some extraordinary behaviour. There had been widespread looting of the deserted houses and businesses by civilians and military men of the Australian Army Provost Corps. Some of the looting was justified on the grounds that goods were being requisitioned for military use. There are, however, stores of refrigerators, pianos and other valuable items being sent south to the families of the looters. Within days a Royal Commissioner, Mr Justice Lowe of the Supreme Court of Victoria, was appointed to investigate both the civil defence implications and the behaviour of civilians and servicemen. Among the findings of the Lowe Report, which was not released until 1945, were that 243 people had been killed and between 300 and 400 injured, that earlier warnings would have saved lives, and that “unfortunate panic" was rife among civilians and servicemen. It is often forgotten that the air-raids of 19 February were only the first of more than 60 raids over the next eighteen months, although none was as severe as those of 19 February. The last raid took place on 12 November 1943. The Japanese also bombed several other northern Australian towns. On 3 March the undefended Western Australian town of Broome suffered a devastating attack. Flying boatds, loaded with refugee women and children from the Dutch East Indies, were destroyed and many lives lost. Later in the month the tiny town of Wyndham was bombed. 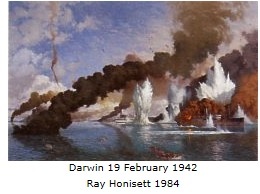 After 22 February Darwin came under military control. The Administrator left Darwin on 2 March for Alice Springs, from where the Territory was governed until 1945, when civil rule returned. The Darwin area became a large Allied base for the offensive to drive the Japanese back from South East Asia. On 28 March General Edmund Herring, just back from the Middle East, took command and from this time the area was adequately defended.